Hon’ble President of India, Shri Pranab Mukherjee inaugurated the first ever Sewage Treatment Plant (STP) in the President Estate at Rashtrapati Bhavan, in New Delhi on June 08, 2015. Lt. Governor of Delhi, Shri Najeeb Jung and Chief Minister of Delhi, Shri Arvind Kejriwal are also seen. The President of India recently inaugurated the first ever Sewage Treatment Plant (STP) in the President’s Estate, enabling the latter to meet 80% of its water requirements for horticulture through recycled waste water. The STP was inaugurated by Hon’ble President Shri Pranab Mukherjee on June 8, 2015. 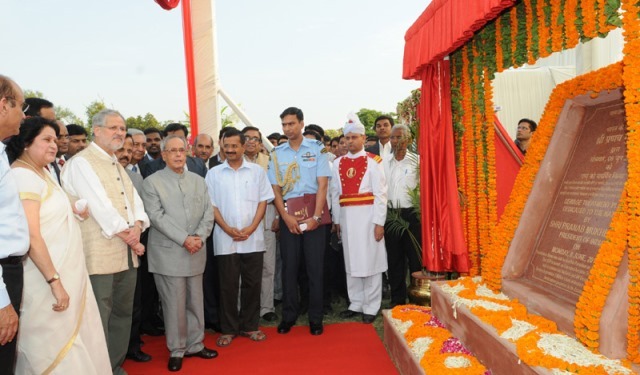 Its foundation stone was laid by the President on February 17, 2014. The installation of the STP in the Rashtrapati Bhawan is in fulfillment of the recommendations of the Comprehensive Conservation Management Plan prepared by INTACH. The President’s Estate has over 190.5 acres of greenery, including the famous Mughal Gardens. Consequently, there is an acute shortage of water for horticulture purposes especially during the summer season. This often led to degradation of the green cover and permanent loss of some variety of plants. The non availability of adequate water was also adversely affecting the fauna which depends on the forest area and green cover in the President’s Estate. The STP has thus come as a boon for the plants and animals and will also help conserve water resource. The STP has a capacity of 20 lakh litres per day. The total water supply to the President’s Estate from NDMC and other sources is in the range of 16-18 lakh litres per day out of which 80% becomes sewage. This sewage and additional quantity tapped from North Avenue and South Avenue Network System will now be treated and utilized for horticulture purposes in the President’s Estate. The project also includes a functional wetland which will further support the flora and fauna in the region. The capacity of the existing Dalikhana Lake, which serves as the collection point of treated water, has been increased three times from its earlier capacity and is now a water body of 5 million litres. This would serve in addition as a habitat for water birds in Northern Ridge area which lacks such water bodies. 18,000 fishlings have also been added to the Dalikhana Lake. The STP was installed with IIT Delhi as the technical consultant while the construction, operations and maintenance of the STP has been given to M/s L&T. The STP is based on the Extended Aeration System with Anoxic Zone for De-nitrification and sub-Surface Constructed Wetland (SSCW) with UV Disinfection Unit.